What's up everyone! After the storms Wednesday I needed a break... but instead I have put in about twenty four hours in the last two days. No tornadoes with the storms, here in Central Ohio, but several microbursts. The worst was in Hilliard, Ohio. A microburst is where the updraft cannot sustain all the energy in the storm so a quick rush of cold air rushes downward and SLAMS into the ground. Once it hits the ground it fans outward at speeds faster than a weak tornado causing more damage than a weak tornado. I was able to sample the radar data from the time of the microburst and we were able to get winds in the mid 80 mph range. 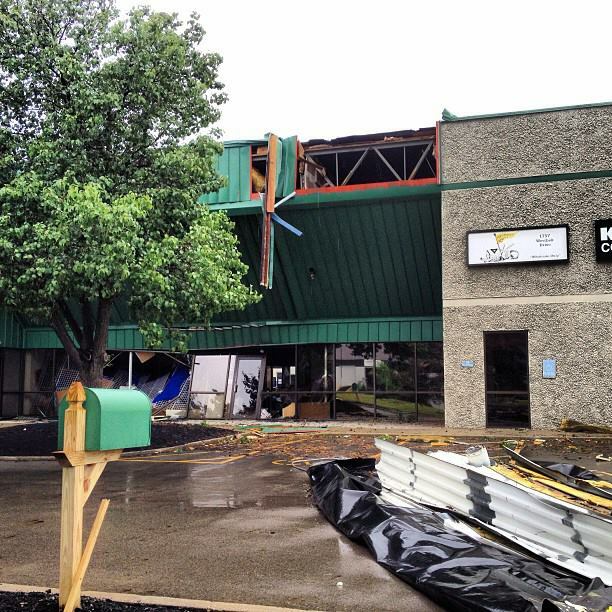 The NWS confirmed the microburst with winds up to 95 mph. When I was looking at the damage just minutes after it had happened I knew it wasn't a tornado. Some of the eye witness accounts said they saw something coming down from the clouds fast and hit the ground and then BAM. That is not how a tornado works... and the damage was too widespread for a tornado. The damage from a microburst is more widespread because the winds spread out from the area of the downburst. Here is an diagram of what a does with the downward winds. Here is another example I found. 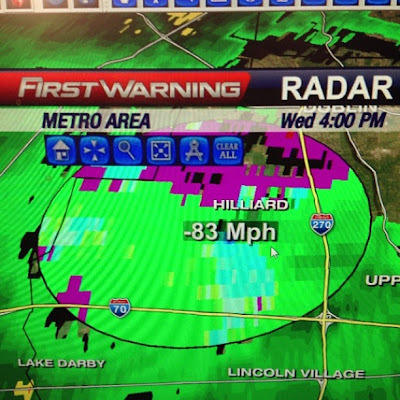 And I leave you with a video of the storm in Hilliard on Wednesday. Alright, other than an off chance to see a spotty shower thru the weekend... it is looking pretty nice. Our temperatures will slowly warm up so today will not be the warmest day at the pool, but Saturday will warm up along with a little humidity and a little more by Sunday as well. By the time we get to early next week we are pushing 90° and about a 30% chance for storms through the middle to end of next week. Typical Ohio weather for you... I just hope it stays fairly dry for the farmers because we could use a week or so of relatively dry weather. Well, enjoy the weekend and have a good one!